Updated at 3:54 p.m. on Monday, April 1, 2019. 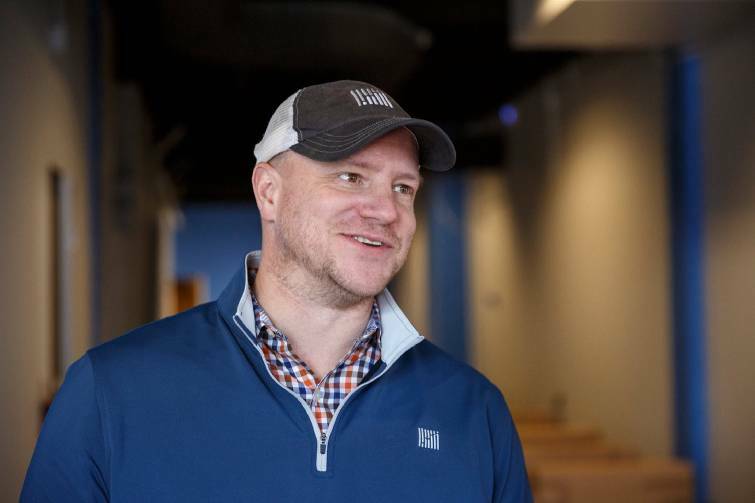 One of Chattanooga's fastest growing business startups has launched a new freight futures market that industry leaders said should help bring more stability and efficiency to America's $726 billion-a-year trucking industry. The new venture should also further propel Chattanooga's growing logistics industry, which already employs thousands of drivers, brokers, warehousing and other logistics workers. 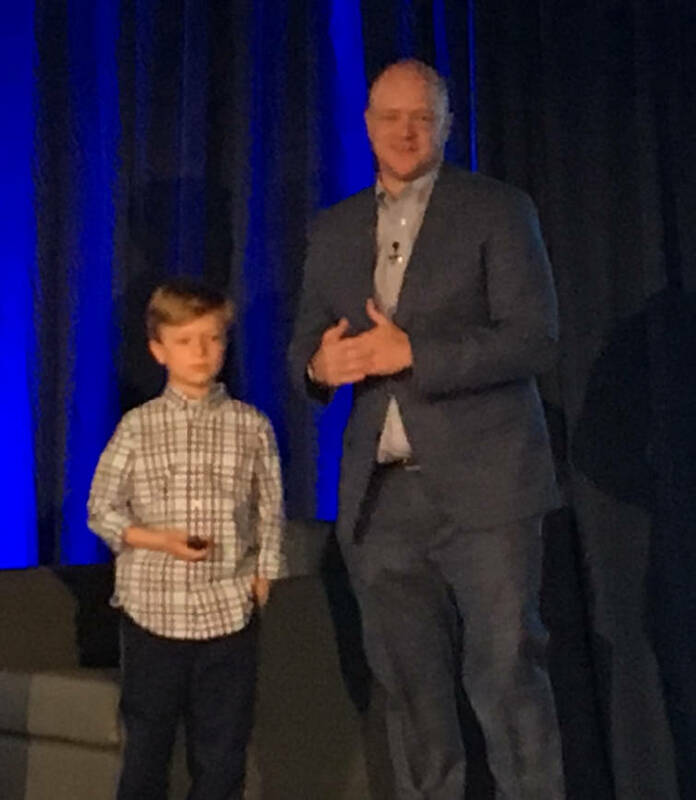 Craig Fuller and his 8-year-old son, McClain, prepare to ring the bell to start freight futures trading on the Nodal Exchange today. 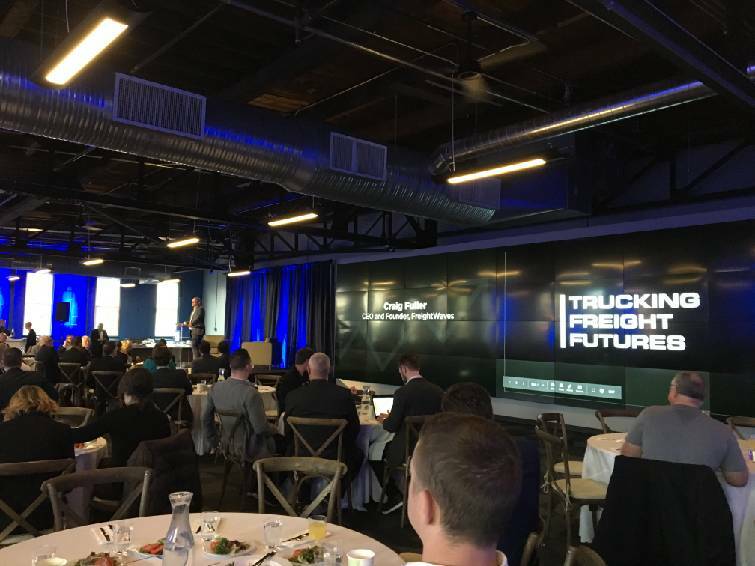 FreightWaves Inc., started less than three years ago by company CEO Craig Fuller, gathered trucking industry and community leaders to its newly remodeled downtown headquarters Friday to sound a semi-truck horn and start trading in a new financial futures exchange for 11 new future contract linked with trucking costs. Within a few minutes, FreightWaves said the first transaction was completed, pricing April 2019 national average dry van spot rates at $1.34 per mile. Trading on the new platform run by the Nodal Exchange, a unit of German exchange giant Deutsche Borse AG, was limited Friday. But Fuller, the 40-year-old son of former U.S. Xpress Enterprises CEO Max Fuller and the brother of the company's current CEO Eric Fuller, said the slow start is typical for new futures markets. "I am very excited and have a lot of confidence in the long-term success of the trucking futures market," he said. "But I don't think we can derive any sort of success metrics out of the first day or the first week or the first month." Over time, Fuller said he expects the market and trading activity to grow as shippers and carriers look for ways to hedge the volatility of their costs. The new freight futures, which trade the financial value of shipments not the physical movement of trucks, allows investors, brokers or those in the industry to bet on whether the price of shipping a product will rise or fall in the future. The financial trades and their underlying value for truck shipments is expected to help open up more data for shippers and carriers and, in the process, reduce inefficiencies and market volatility. "The innovation that is taking place in this industry is profound and I think this new futures market is part of that change and will help encourage even more transparency and data analytics to freight shipments," Fuller said. Recent advancements in transportation technology through telematics, smart phone apps and electronic logging devices have produced far more data which can now be mined to help determine shipment trends, prices and movements needed for a financial market to function. To support the new market and the changing logistics industry, Fuller created FreightWaves in 2016 as a provider of news, data analytics and risk management tools. The company introduced its SONAR system last May, which industry experts liken to the Bloomberg terminals that provides information for stock traders in thousands of locations across the country. FreightWaves has already grown to 90 employees in Chattanooga with an average starting pay of over $90,000 and is projected to grow to more than 260 employees over the next five years. Fuller said FreightWaves expects to triple in size this year and has already grown the business to an annualized run rate of $19 million. FreightWaves CEO and Managing Director Craig Fuller talks about the company's Haul of Fame museum on Wednesday, Nov. 28, 2018, in Chattanooga, Tenn. In only a couple of years, FreightWaves has become the No. 1 news source in the trucking industry with more than 2 million pageviews a month. FreightWaves has raised $40 million in venture capital, including an investment from former Chattanooga Mayor and U.S. Sen. Bob Corker who heralded the start of trading Friday as another boost for Chattanooga's growing logistics industry. "Chattanooga is a transportation and logistics hub, and I am proud to see another homegrown company that is already making an impact in the world of freight," said Corker, who previously served on the board of U.S. Xpress before running for Chattanooga mayor in 2000. FreightWaves is partnering with Nodal Exchange, which is a leading power futures exchange, and DAT Solutions, which collects data on millions of shipments, to create freight futures contracts that will allow market participants to hedge exposure to rate volatility nationally, Fuller said. "We can help take data and help create a more transparent market," Fuller told those gathered for the kickoff of the new futures market. DAT has created a North American trucking market spot lane price assessment methodology specifically for the settlement of the Trucking Freight Futures contracts. Monthly futures contracts will be listed on Nodal Exchange and cleared through Nodal Clear. "We're thrilled to be providing transparency, liquidity, and risk management to the trucking industry, the backbone of the U.S. economy," said Demetri Karousos, chief operating officer of Nodal Exchange and chief risk officer at Nodal Clear. Shelly Simpson, executive vice president and chief commercial officer for J.B. Hunt Transport Services who has been with the nation's biggest trucking company for 25 years, said she believes FreightWaves and the new futures market is part of a growing data-based move toward more transparency that should help reduce the idle time and waste in the industry. 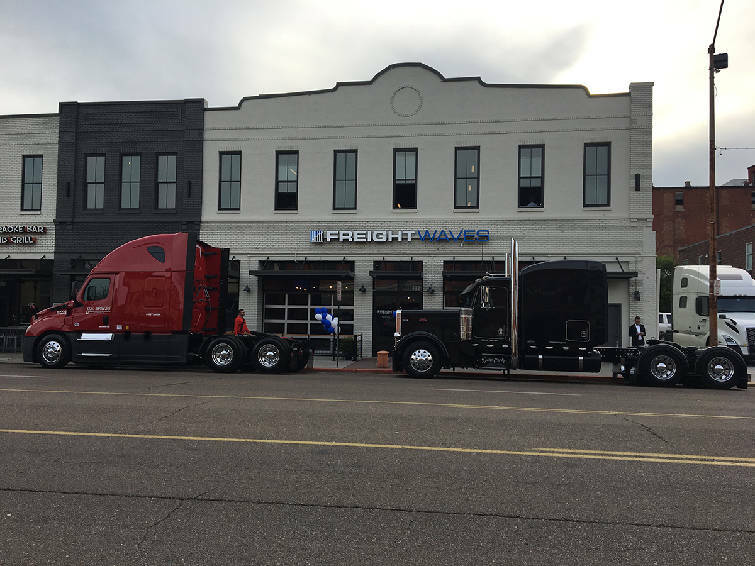 The new FreightWaves headquarters on Market Street in downtown Chattanooga marked the opening of trading Friday, March 29, 2019, in the new freight futures market. "We do believe in Craig and what he is doing and that FreightWaves is part of a creative disruption in our industry," she said. today. "We're big users of FreightWaves." The new freight futures track prices only in the spot market, where shippers and carriers negotiate rates for shipments to be made in the next few days or week. Major shippers that rely upon long-term deals may not be enticed to get involved in the market. But 83 percent of the trucking companies in America have fewer than 10 trucks so the industry remains fragmented and ripe for the development of a futures trading market, Simpson said. Simpson added that many of the trips made by America's 3.5 million truck drivers involve idle time or empty trucks, which she estimates could result in up to one third of all time wasted. "I know of no other industry that wastes so much time," she said. "That problem has to be solved." Donald Broughton, managing partner for Broughton Capital, said shared data and price transparency encouraged by market trading in the shipping market, combined with new technologies, should help reduce the waste and inefficiency in the industry. Broughton likened Fuller's pioneering approach to freight futures to Fred Smith's 1973 vision to create overnight air shipments with his Federal Express in Memphis. Fuller said he was day trading in 2016 and wondered why there was not a futures market for truck shipments. He traveled to London, New York and Washington D.C. to discuss the idea and recalls one exchange broker who told him the trucking industry wasn't big enough for such a futures market. But the trucking industry is nearly twice the size of many of the agricultural and petroleum commodities widely traded on the futures market and similar to the electricity futures market which began trading futures in the 1990s. "We're really excited to participate in this thing that I think is going to be an historic change in trucking," he said. CORRECTION: A previous version of this story misquoted Shelly Simpson, executive vice president and chief commercial officer for J.B. Hunt Transport Services. She said "creative disruption in our industry," not "creative destruction."